Until recently, the news was a very black and white subject (see what I did there?). There was news and “not news” as judged by internet users who felt the need to critique “that’s not news” in the comments section on more light-hearted stories or features especially on social networks like LinkedIn. Now there is a new scourge in the information technology age the dark sith that is “fake news”, said to be behind the selection of Donald Trump as US president and more outlandish conspiracy theories like our beloved John Cena passing away. Fake news has taken the concept of link baiting and evolved it into something so much more powerful, using provocative headlines and content to shock users into sharing and engaging with content only to use that spike in visits to make a quick buck off ad revenue. Fake news preys low attention span and popular headline scheming that's become a social media behaviour staple and taken advantage of it. In an ideal world fake news would not be a problem, in an ideal world a user would see a fake article, open a new tab and visit Bing or Google and fact check, but this is not the ideal world. Social media users are reactive and like fight or flight, on your newsfeed its I care so I share. Many social media sites have been hit by the fake news pandemic but none much harder than Facebook and the media giant has had to take a stand and be proactive about protecting itself, its users and its very profitable newsfeed. Following up on its promise from December, Facebook has begun to flag fake news stories on news feeds in the US. Questionable stories may now show a “disputed” tag underneath, with a link to a source countering the article’s claims. Facebook said it works with ABC News, Politifact, FactCheck, Snopes, and the Associated Press to verify stories back in December. While it’s a welcome step in the fight against fake news it does have its shortcomings. Mainly, the process is too slow. 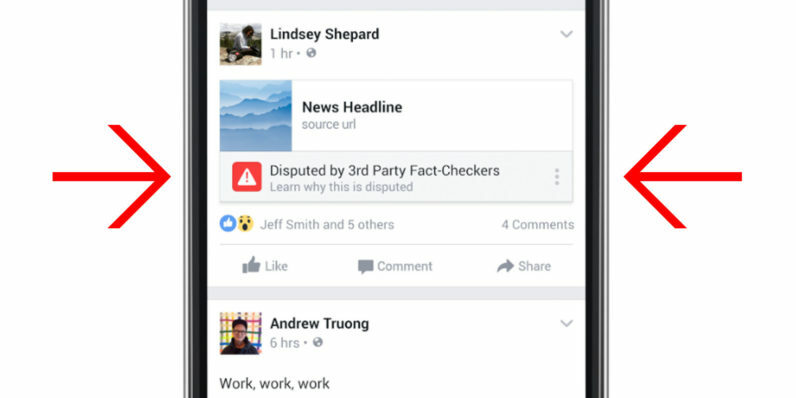 Users have to report a story as fake, or Facebook’s software needs to notice something fishy. It can then take several days before a fake news story is assessed by fact-checking organisations, and at least two of them have to agree before the label is applied. By then, a story may have been widely disseminated, and much of the damage done. But hey, baby steps. We have no doubt this is only the first step into building machine learning algorithms that will be able to achieve a more scalable approach and kerb the spread of fake news. A guest post by Adelyn Zhou on how to improve your odds of success by making sure you avoid this common chatbot and bot marketing blunders.